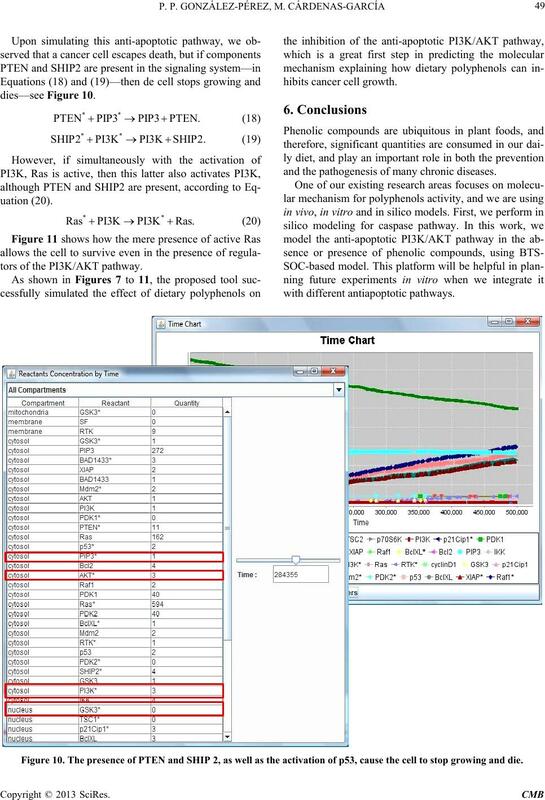 and show how it can be applied to the simulation of complex interaction patterns of intracellular signaling pathways. 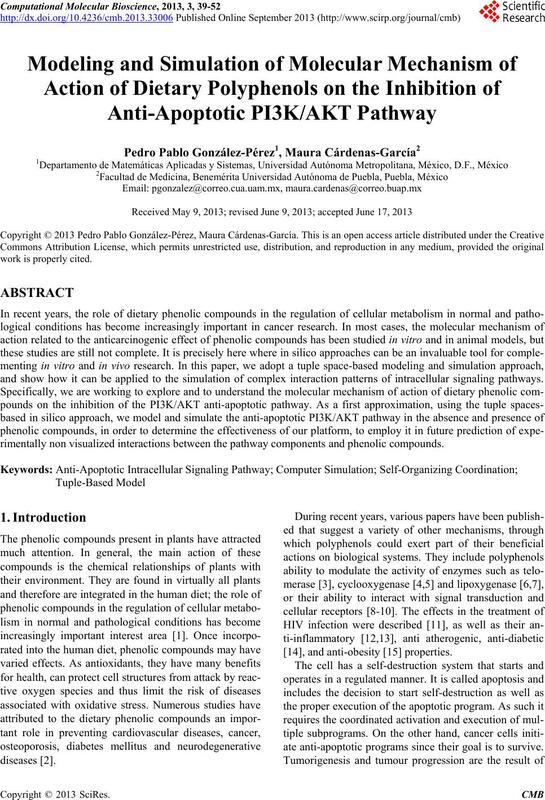 rimentally non visualized interactions between the pathway components and phe n olic compounds. ate anti-apoptotic programs since th eir goal is to survive. menting in vitro and in vivo research. cal reactions that defines its behavior. tion and state of the reactants. result of bi ochemical reactions. simulation or during the execution of it. tration and time dependent manner [23,24]. interac ti on s can be supported by the dr aw ing canvas. of PTEN leads to decreased levels of survivin mRNA. tics of our current work and moves it according to our needs. achieving a comprehensible and functional simulation. presence o f ph e nolic compounds apoptosis may continue. • Concentration in each cellular compartment. • Cellular compartment to which it belongs. which the resultant reactant must be registered. Figure 5. The anti-apoptotic PI3K/AKT pathway. reactions in a straightforward way. four intracellular compartment s—see F igure 6.
and made available in the linked compartment. vated—have to be put in the BTS. in the compartment at the beginning of the simulation. of the number of units of such a reactant. Figure 6. 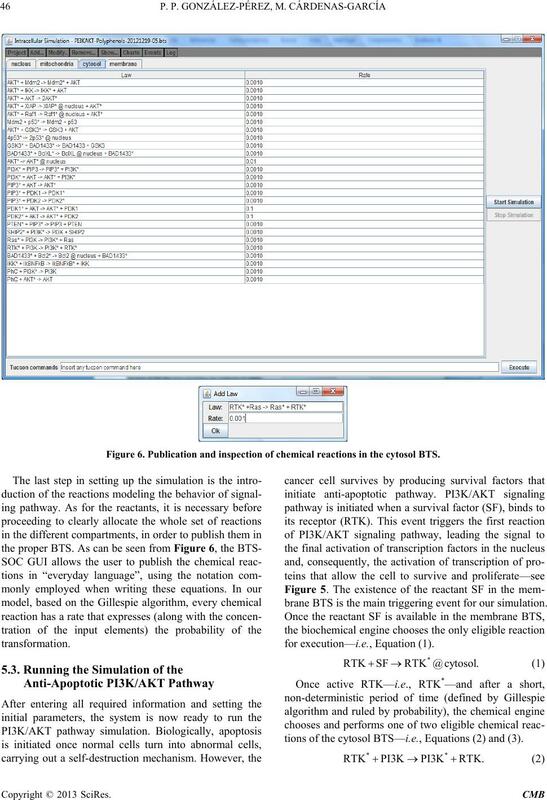 Publication and inspection of chemical reactions in the cytosol BTS. 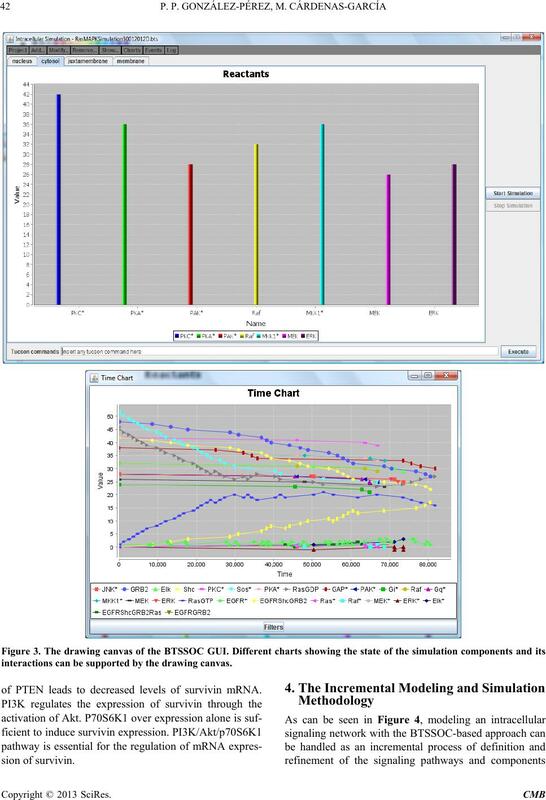 brane BTS is the main triggering event for our simulation. 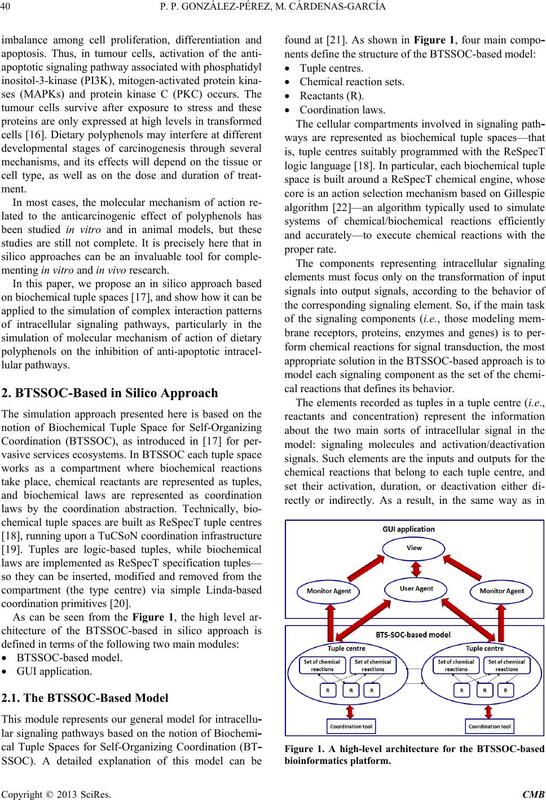 tions of the cytosol BTS—i.e., Equations (2) and (3). signal, as shown in Equation (4) to Equation (10). uation (11) to Equation (17). 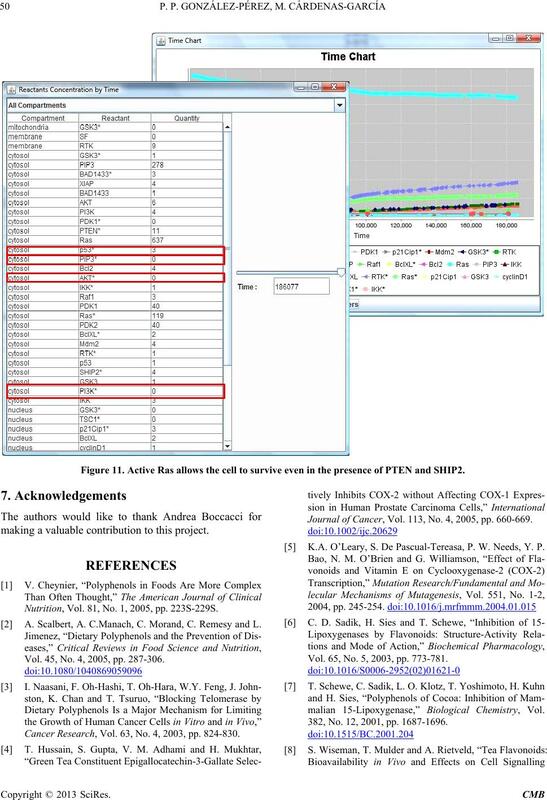 transcription factors in the nucleus BTS. rylated state of the reactant. 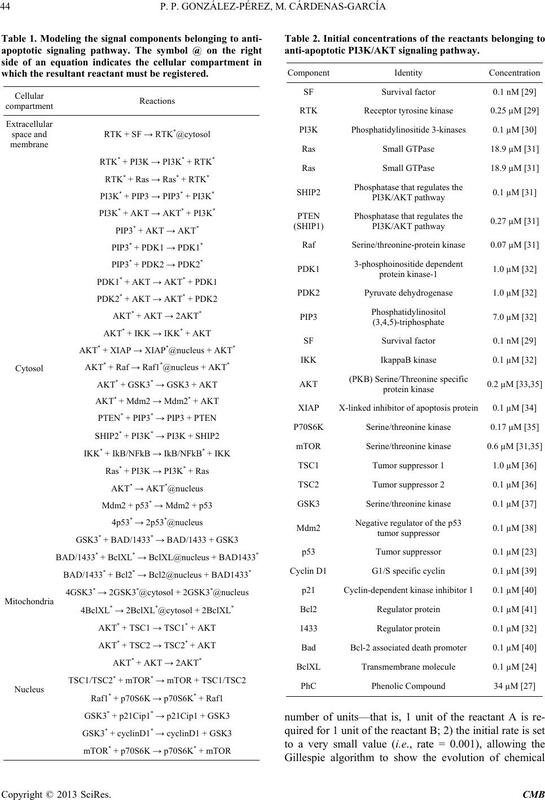 many downstream effector proteins. At the bottom of the graph can be seen all the reactants implicated in these reactions. The symbol “*” refers to active/phosphorylated state of the reactant. 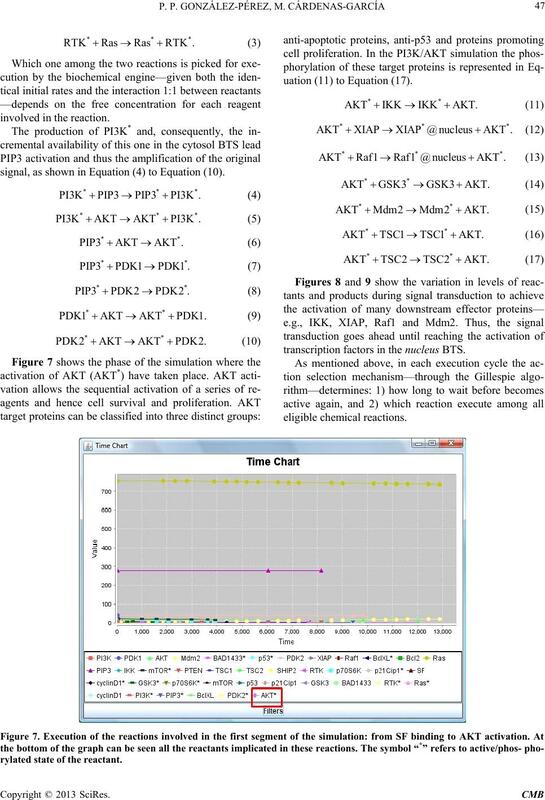 tion of many downstream effector proteins. tors of the PI3 K/ A KT pat hway. and the pathogenesis of many chronic diseases. Figure 10. The presence of PTEN and SHIP 2, as well as the activation of p53, cause the cell to stop growing and die. Figure 11. Active Ras allows the cell to survive even in the presence of PTEN and SHIP2. making a valuable contribution to this project. Nutrition, Vol. 81, No. 1, 2005, pp. 223S-229S. A. Scalbert, A. C.Manach, C. Morand, C. Remesy and L.
Vol. 45, No. 4, 2005, pp. 287-306. Cancer Research, Vol. 63, No. 4, 2003, pp. 824-830. 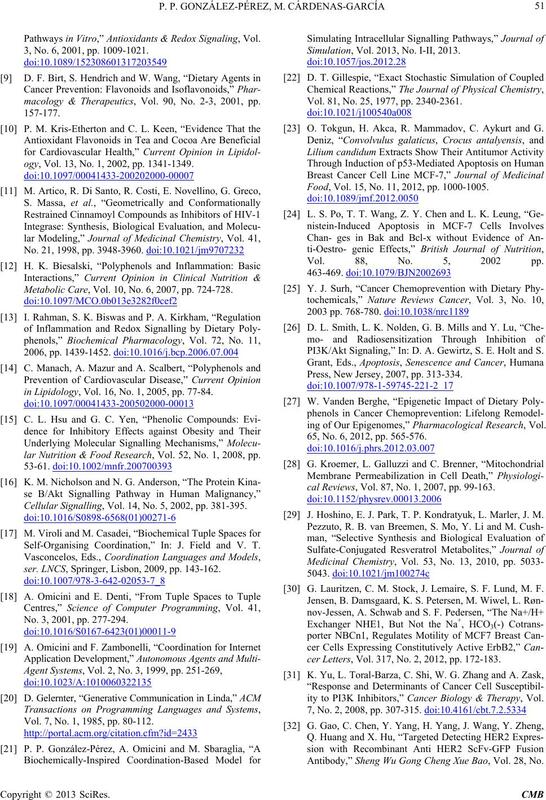 Journal of Cancer, Vol. 113, No. 4, 2005, pp. 660-669. K.A. O’Leary, S. De Pascual-Tereasa, P. W. Needs, Y. P.
Vol. 65, No. 5, 2003, pp. 773-781.
malian 15-Lipoxygenase,” Biological Chemistry, Vol. 382, No. 12, 2001, pp. 1687-1696. Pathways in Vitro,” Antioxidants & Redox Signaling, Vol. 3, No. 6, 2001, pp. 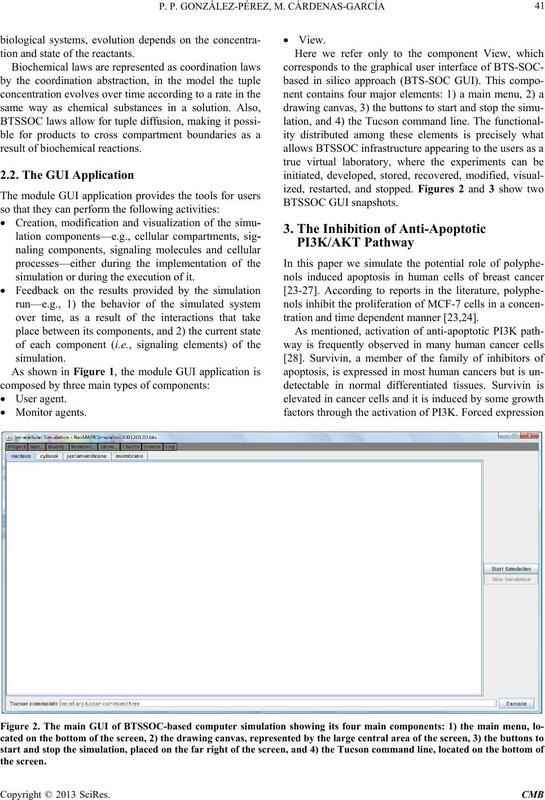 1009-1021.
macology & Therapeutics, Vol. 90, No. 2-3, 2001, pp. ogy, Vol. 13, No. 1, 2002, pp. 1341-1349. Metabolic Care, Vol. 10, No. 6, 2007, pp. 724-728.
in Lipidology, Vol . 16, No. 1, 2005, pp. 77-84.
lar Nutrition & Food Research, Vol. 52, No. 1, 2008, pp. 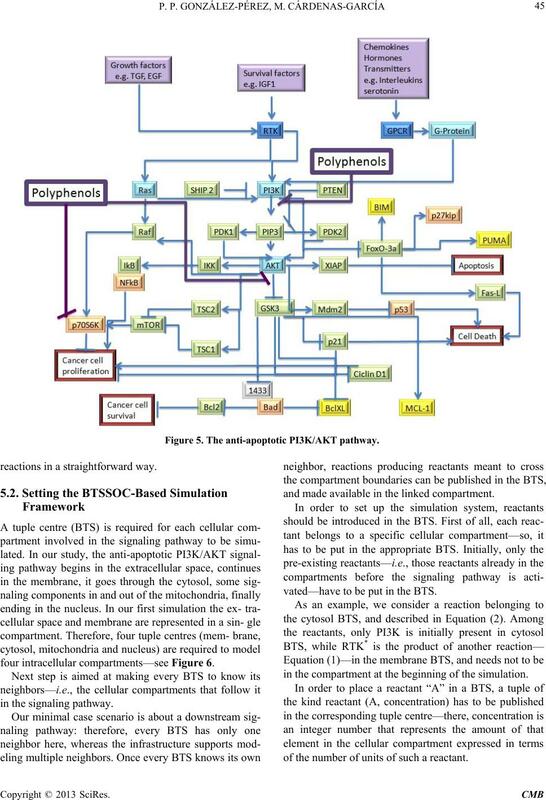 Cellular Signalling, Vol. 14, No. 5, 2002, pp. 381-395. Self-Organising Coordination,” In: J. Field and V. T.
ser. LNCS, Springer, Lisbon, 2009, pp. 143-162. No. 3, 2001, pp. 277-294. Vol. 7, No. 1, 1985, pp. 80-112. Simulation, Vol. 2013, No. I-II, 2013. Vol. 81, No. 25, 1977, pp. 2340-2361. O. Tokgun, H. Akca, R. Mammadov, C. Aykurt and G.
Food, Vol. 15, No. 11, 2012, pp. 1000-1005. Vol. 88, No. 5, 2002 pp. 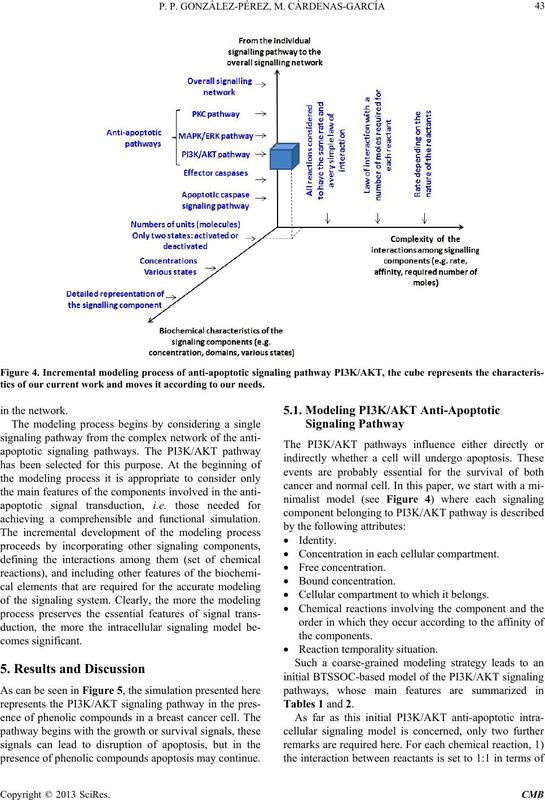 PI3K/Akt Signaling,” In: D. A. Gewirtz, S. E. Holt and S.
Press, New Jersey , 2007, pp. 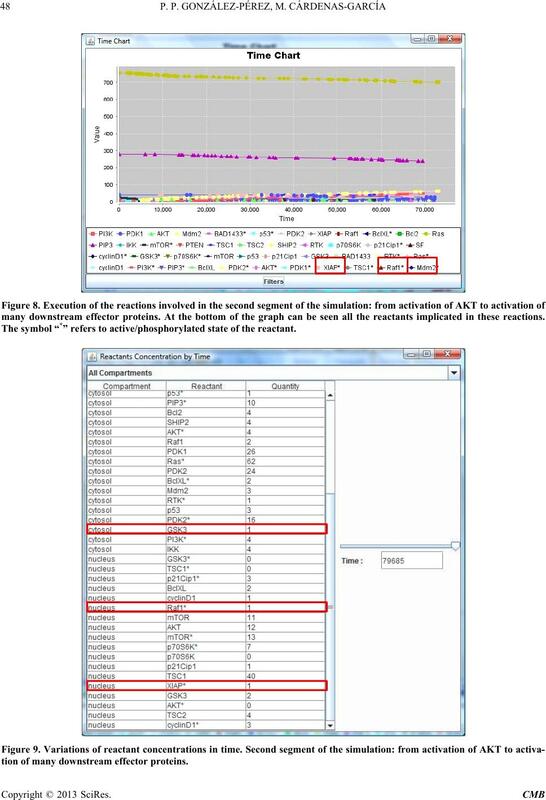 313-334.
ing of Our Epigenomes,” Pharmacological Research, Vol. 65, No. 6, 2012, pp. 565-576.
cal Reviews, Vol. 87, No. 1, 2007, pp. 99-163. J. Hoshino, E. J. Park, T. P. Kondratyuk, L. Marler, J. M.
 G. Lauritzen, C. M. Stock, J. Lemaire, S. F. Lund, M. F.
cer Letters, Vol. 317, No. 2, 2012, pp. 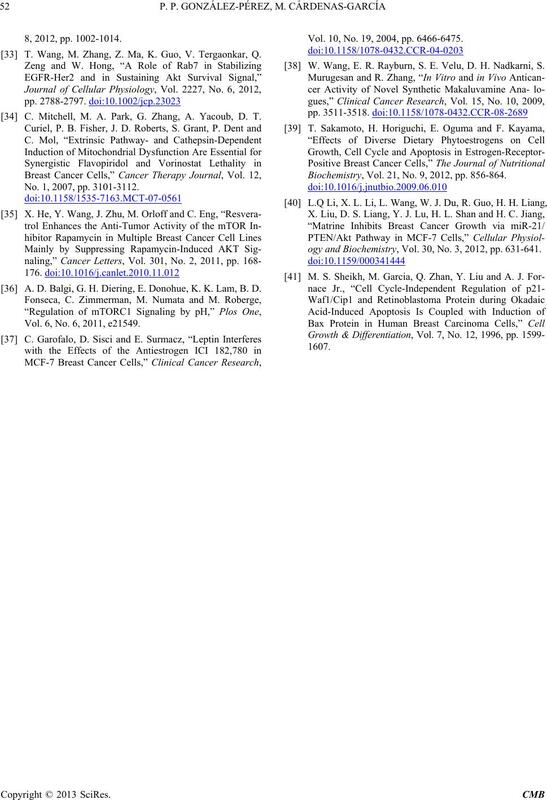 172-183.
ity to PI3K Inhibitors,” Cancer Biology & Therapy, Vol. Antibody,” She ng Wu Gong Cheng Xue Bao, Vol. 28 , N o.
 T. Wang, M. Zhang, Z. Ma, K. Guo, V. Tergaonkar, Q.
 C. Mitchell, M. A. Park, G. Zhang, A. Yacoub, D. T.
No. 1, 2007, pp. 3101-3112. A. D. Balgi, G. H. Diering, E. Donohue, K. K. Lam, B. D.
Vol. 6, No. 6, 2011, e21549. Vol. 10, No. 19, 2004, pp. 6466-6475. W. Wang, E. R. Rayburn, S. E. Velu, D. H. Nadkarni, S.
Biochemistry, V ol. 21, No. 9, 2012, pp. 856-864.
ogy and Biochemistry, Vol. 30, No. 3, 2012, pp. 631-641.